Westerwood is a stylish neighborhood of comfortable and well-constructed homes that is convenient to nearby colleges, shopping, and downtown Greensboro. Known for its walkability, diverse array of 1920s historic architecture, and tree-lined streets and sidewalks, Westerwood is an eclectic neighborhood comprised of community-oriented residents from all walks of life. Creative and colorful murals can be seen on homes, businesses, and walls throughout the area, representing the large artist population who reside in the neighborhood. Westerwood’s development dates back to 1919 when local developer Arthur K. Moore platted the neighborhood and construction of homes began soon after. Its close proximity to downtown made it a desirable location for middle-class housing. 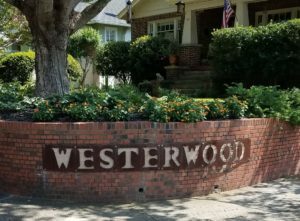 A majority of homes in Westerwood were built during the 1920s and feature classic architectural styles popular during the period such as Craftsman bungalows, Tudor Cottages, and Colonial-inspired facades of brick, stone and wood. Homes in the neighborhood are primarily small- to medium-sized single family homes and small apartment buildings. Many of the residences in Westerwood are relatively historic, built no later than 1939. A number of residences were also built between 1940 and 1969 and feature more traditional styling. Westerwood’s median real estate price is $225,083. Lying just west of Greensboro’s vibrant downtown, Westerwood encompasses about 650 homes. Lake Daniel Park winds throughout the neighborhood and includes a children’s playground, tennis courts, and a sand volleyball court. Cyclists, runners, and walkers enjoy the Lake Daniel Park Greenway which converges in Westerwood with the Atlantic and Yadkin Greenway, the Latham Park Greenway, and the Downtown Greenway. Neighbors can often be found at the local watering hole, Westerwood Tavern, where dogs are also welcome. The area is also home to Double Oaks Bed & Breakfast, an inn located in one of the neighborhood’s largest and most historic homes, which was built in 1906 by North Carolina’s first registered architect, William G. Armfield. The Westerwood Neighborhood Association is very involved in the community and holds several annual events including the Westerwood Neighborhood Art & Sole Art Walk and Studio Tour and the Westerwood Neighborhood Chili Cook-off. Click the Apply button to see all the homes for sale in Westerwood- to see this search full screen, Click Here!